I'm soooooooooooooo happy to announce the winners here today!!! I love this! It's amazing. What a fab prize, I liked and shared on facebook, and love what the prize will do. I would love to win this prize, I live in the UK so I hope that doesn't matter. Great Stuff, so creative! Would love to win! Contact me with your mailing address at cain81@mtco.com and she'll get that out to you! Congrats and thanks to everyone who played along. 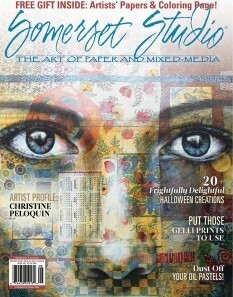 Jenny has been absolutely wonderful to work with and I so enjoy their stamps and stencils. Since tags are right up there on my list of favorite things to make, this is what I came up with for my tutorial. I absolutely ADORE this Little Boy stamp. The detail is amazing. 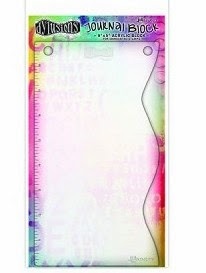 The Background Stamps and Numeric Plate are perfect for just about everything! I'll lead you through this project and give you the links to the products used. Don't forget, there's still time to enter the drawing on the previous post for PRIZES. 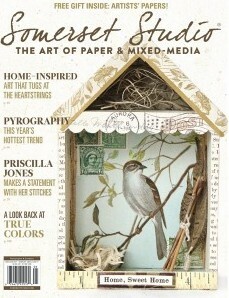 Bird Cage and a GIVEAWAY from Retro Cafe Art! Hey there everyone! We in the Midwest are soooooooooooooo ready for Spring. 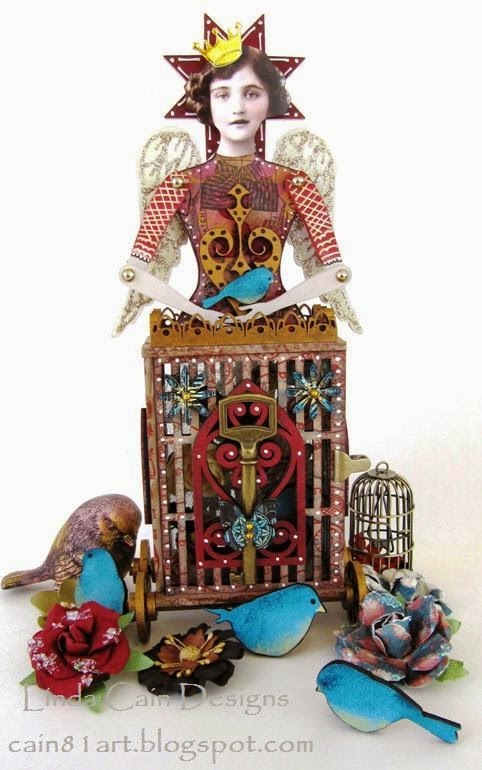 There will be THREE winners of all 3 products...a Birdcage Kit, The Birds and The Wheels!!!!! As always, these kits come cut from Masonite so you can paint and decorate before or after you put them together. Here, I used PaperArtsy Fresco Paints, and Blue and Red Archival Inks with stamps, to decorate the outside. White Sharpie Poster Paint Pen is used for the dots. (my go-to pen of choice). The VERY cool squiggly stamp used on the top and bottom is the Eclectica Darcy Mini 06. I toned down the paper with Distress Inks to make it the color I really wanted. The Crown is a brad I've had forever. The Arms are painted with Blood Orange and Claret paints with White Pen embellishing. I used Platinum Stickles on the wings to brighten them up, and her Star behind the Fairy Art Doll Head Cut Out is one from the Star Mix Cut-Outs. The Mini Fairy Bloom Flowers and Butterfly (Garden Insect Cut-Out) are painted with the same colors as the Bird Cut-Outs.....Sky, Inky Pool and Haystack Fresco Paints. I used Jet Black Archival Ink and my new favorite Lynne Perrella 028 set over the flowers and butterfly. The inside is basically the light color Stone and Bronze Delta Acrylic paint on the other pieces. I was going to use the hearts added back in, but changed my mind. How cut is the little Heart Bird Trinket Keepsake painted up and with just a piece of collage paper inside from DP77 Collage Sheet??? These brilliant Classic Rolling Wheels are so easy to put on anything you want to roll. I painted them Bronze and glued in place. Easy Peasy! The little gold spring clip worked perfectly for a handle on the door. The inside has Ivory tulle and lots of paper flowers for the little bird. The Gothic Arch Scroll Cut Outs were painted with Blood Orange and Claret paint and added to the sides, front and back. My Sulking Little Bird sits on the ledge in the Sun Porch....he's waiting impatiently for Spring to arrive, too! Leave a COMMENT here by Monday March 31st 12:01 AM for a chance to win one of 3 prizes from Kristin! This is my favorite side of my project. WAIT..... maybe it's this side!!! Sizzix ScoreBoards XL Die - Blocks/Cubes 3-D that cuts 3 different sized blocks. Next I cut 6 - 2 1/4 inch and 6 - 1 3/4 squares from Metal Foil Tape and 4 Melodic Birds with Vintaj's Thinlits die. These are all embossed using different areas of the 6x6 Embossing folders from Vintaj. I used Iron Scrollwork, Nouveau Tiles and Leaf Rosette folders. This is the smaller group. The 2 on the far right are embossed with the little folders that come with the Melodic Bird Die. Really cool to get 3 folders with the bird! I added several layers of Fresco Paints with Cut-n-Dry Foam. When dry, I decided to sand off parts of the paint for contrast. I painted the larger squares too, but decided not to sand them. When they're dry, you can see where to go back and get complete coverage. Next I put 3 sides together and added the birds. Having the peal-off sticky back makes this so easy. I left them unpainted so they'd show up really well. After trying out all kinds of ideas for the middle sections....round flat wheels, 4 little pegs, 4 pediments....nothing I liked...I finally settled on the height of these little wooden blocks. At first I added the above metal foil die cut strip, but found it too small and later added a larger strip I embossed with an embossing folder. The bottom is with 4 larger wooden blocks glued together, painted black and trimmed with an Industrious Border Sticker. I looked at this photo and thought I definitely needed another piece of silver around the middle. Always a work in progress. And it was all glued together when I also decided the top needed something, too! This is actually a cool drawer pull I found at the Hardware store. But it looked kind of plain, so I cut 3 little squares of the foil, embossed it, and stuck it on the balanced cube. Like I said, always a work in progress until it actually goes up! And one last shot of the gorgeous birds and the 2 sides on top with the Thinlits little embossing folder designs. Thanks for stopping by, and as always, let me know if you have any questions. This was a really easy project that just seemed to come together. There's just a little stamping, and very little inking, but I LOVE how it turned out. I used a piece of black mat board as the base. The Boy and his Dog are perfect from the Found Relatives pack, and one of the new Arrows balanced the left side of the card. The Special Delivery and US 7Cent Stamp are from the Ephemera Pack/Expedition, as well as the 13 circle under the Monocle. A bit of Trimmings-Red/Natural was tied to the Monocle creating 3 pieces of Red for composition. Different angles....different lighting....the Alcohol Inks are sooooo cool on metal!!! The Pediments die was used to cut Metal Foil Tape on chipboard. Various colors of Alcohol Inks were dabbed on with an Ink Applicator Tool, and a few tiny swirl stamps were added last with Jet Black Archival Ink. The only way to see the colors of the Alcohol Inks is to photograph at an angle....so the smaller pictures show the detail best here. Best Friends are from Chit Chat and are easily layered onto black chip board. Take a look at the links to Inspiration Emporium and use my code iecain81 for 10% off your order. 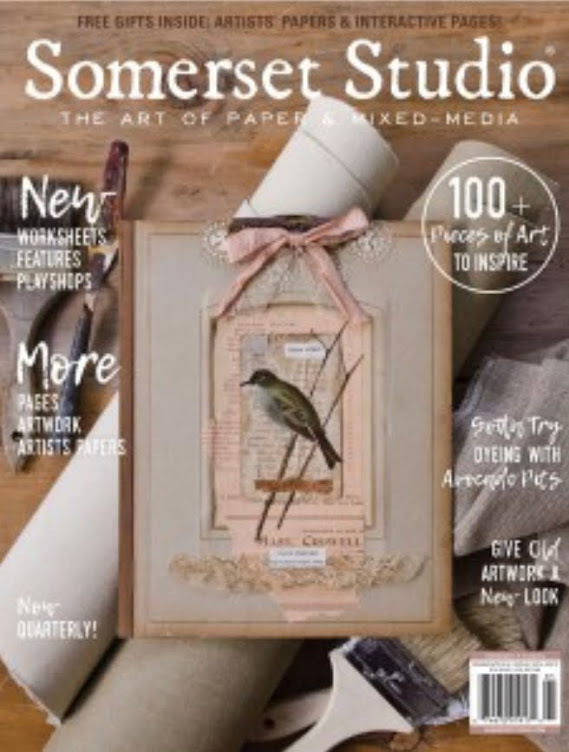 I Love This Artistic Stamper Journal Page! UPDATE! 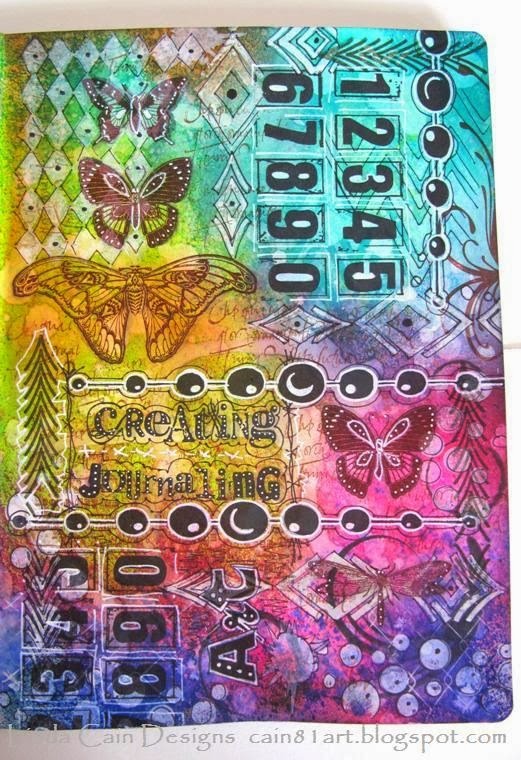 I'm back at The Artistic Stamper Blog with a loaded tutorial today. OOPS! Sorry folks...I forgot about us turning the clocks ahead last week...so my post went up an hour before Jennies!!! Sorry. Should be there soon. 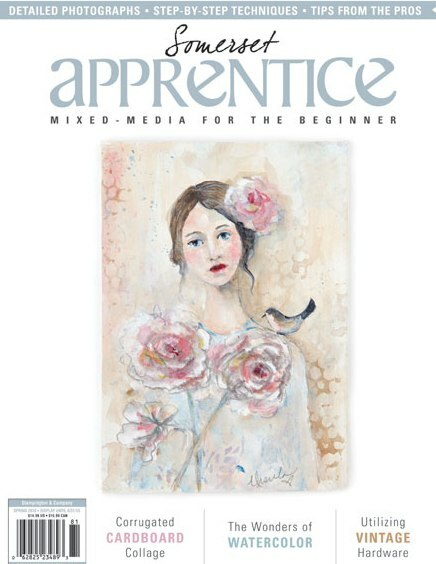 Check out this Journal Page and let us know what you think. You won't want to miss all these great stamps and masks! It really is a fantastic tool that can be used for adding journaling or as a guide for cutting your pages as I did here. Here's just a few steps to this 5 section, 3 page Journal page. There's a lot of spraying, stamping, embossing, stenciling and ghosting here, but I'm mainly showing you how to cut and assemble your pages. The decorating is up to you. I used Dylusions Spray Inks and Distress Inks with several pens and markers. This spread actually required 3 single pages. The white section below is cut and removed from the middle page by just tracing the edge of the block 2 inches from the edge. The white piece is removed, embossed and decorated. Since you cut the smallest section OUT of the Journal, you're able to run it through an embossing folder if you want before adding it back into your book. This is page 1 on the left. You draw and cut the larger section on the right 3 1/2 inches from the right edge. Remove and decorate as above with stencils and pens. My second page is actually upside down....but I didn't care. You can decide how you want yours to be. The pink Flower page was mostly stamped and decorated with white pens. After decorating, take the 2 cut pieces, match the edges and add to your Journal with Tissue Tape on top of page 1. This shows the last page on the right (page 3) and the back side of the above flower page 2. Turn the page, and you should see this! Page 1 (backside), 2 (front), and 3 (front). Get it? Confused yet? Just take your time and it should all come together for you and look like this after you've gotten them all inked and stamped. So, in review, 3,4, and 5 sections are permanently in the Journal. Sections 1 and 2 are pieces cut and added with Tissue Tape. Most of the products I used can be found at Inspiration Emporium. Use the links below and my code iecain81 to receive an additional 10% off your order. And don't forget to enter the Challenge to win a prize! This little guy was just so much fun to make. He's done with blocks from the Eileen Hull ATB die that was showcased at CHA. 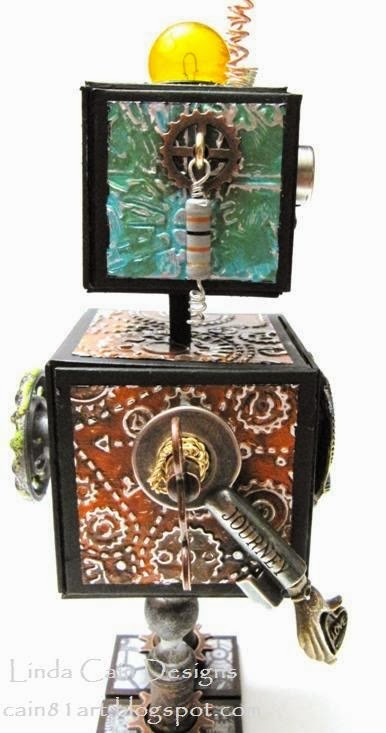 The Altered Trading Block dies are really great to work with and they're IN STOCK at the Inspiration Emporium link below!!! His fun smile is a piece of a brass gear cut to fit the circle embossed area. Computer parts make up his nose and goggles. The eyes are just silver metal pieces I painted to look like eyeballs. I started by using Vintaj Patina Paints on Metal Foil Tape that I'd embossed with the Blue Print and Gears Texture Fades embossing folders. I sanded back the tops to reveal the silver. Then I cut them out about 1/4" smaller than the blocks. I added them to blocks that were painted black.. Then a Faucet Knob that's dipped in Ultra-Thick Embossing Enamel and heat embossed is added to the back. The Arms are a combination of a Word Key, a Clock Key and Antique Brass Love You Hand Charms. Metal wire was also wrapped around the key. He has a Mini Gear added with a Screw Eye. The computer component adds a little fun as a dangle. The Light Bulb is colored with Sunshine and Butterscotch Alcohol Ink, and curled copper wires are also added to his head. Two tiny lightbulbs were added in the front. 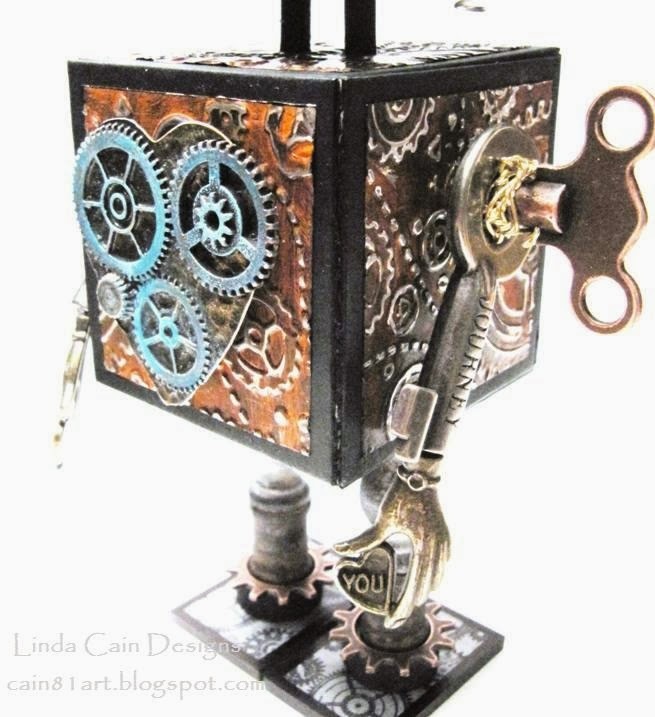 His Large Steampunk Heart Pendant was painted with acrylic paints to make them stand out better, and another Mini Gear was glued onto the right. I cut the loop off the pendant and sanded it down. The 2 dowels are used for his neck. The legs are wooden pieces with tiny spools on top of Bingo numbers aka Game Pieces painted black, and a Sprocket Gear. Love it when things just fit together! The hardest part was making him balanced enough to stand. So the slider feet out of chipboard made him much more stable. Hope you enjoyed this little step-out. 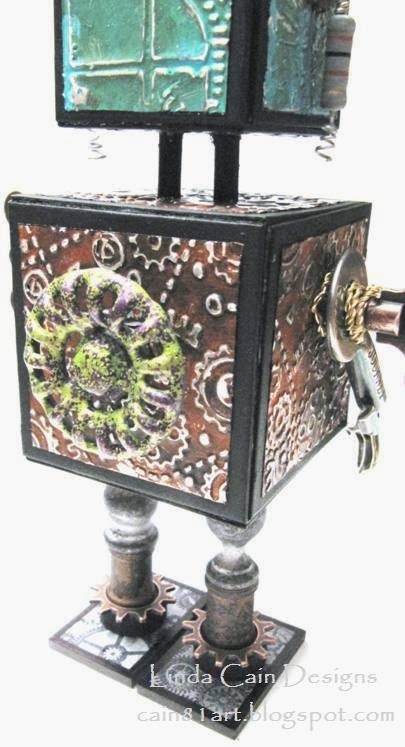 Try using your metal and Vintaj paints to create some wonderful pieces of ART. Check out all the links on each product. Most can be found at Inspiration Emporium or Retro Cafe Art Gallery. Use my code iecain81 for 10% off you Inspiration Emporium order. 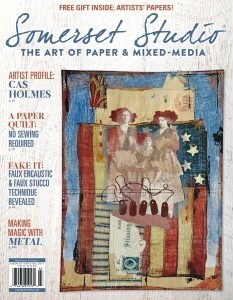 I'm honored to be Guest Designer today on The Artistic Stamper Blog! I think this is one of my all-time favorite creations.....the stamps are just too perfect. 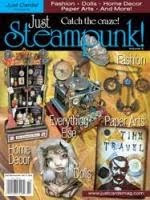 You've got to love Phineus Pinchbeck here inside the Steampunk Shrine. I have a full tutorial over there with a complete list of products and links for you to click over there. And of course Goose Grease here on the back is one of my favorite stamps. Those who know me, know I LOVE Steampunk, this little ATC Steampunk Shrine from Retro Cafe Art Gallery worked perfectly with these fun stamps. 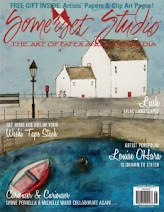 So jump on over, check out the links for the stamps, paints, inks, ephemera, and such, and let us know what you think. AND there's a drawing to WIN free products....enter a stamped project to win!